Imagine trying to schlep all that around without a bag? You couldn’t. And because you couldn’t your game would be compromised. There are a lot of different tennis bags on the market today and below we’re going to review the 5 we feel are the best. When you stride out to center court for your big match you’ll want to look and feel your best and know that your equipment is dry and safe and ready to go, just the way it was when you packed it into your Babolat Club X6 Racquet Holder bag earlier in the day. The X6 features dual, fully adjustable shoulder straps with copious shoulder padding so that, no matter how full you’ve packed the bag, carrying it is always a comfortable exercise. You have the option of carrying it like a backpack, slinging it over one shoulder or carrying it at your side via the strong, well placed handle. A large outer pocket provides plenty of room for support items and the non-PVC material keeps everything nice and dry even if you experience some mid-match rain. The distinctive coloring of the X6 from Babolat makes a statement the minute you stride out of the locker room onto the court. You’re here to play tennis, not to play games. All of your equipment from your racquets to your power bars will be where you put them ready to be put into action, vanquishing your opponent or rejuvenating you between sets. Storage of up to 6 racquets: With some tennis bags putting more than a couple of racquets inside causes the bag to become unwieldy. Not so with the X6. Even when filled to capacity it still retains proper balance and is never awkward to carry or difficult to mount or dismount. Great looks: This Top tennis racquet case looks smart. It looks like it was designed by serious tennis players who know the importance of comfort and balance and who appreciate sophisticated design that’s distinctive without being loud or tacky. Durable construction: The X6 will be with you for years, even with regular use. Materials and stitching are both top of the line and you won’t see any fraying around the edges after only a few uses like you will with lesser bags. Phenomenal value: At around $40 the Babolat Club X6 Racquet Holder bag is just a phenomenal value. You could buy 3 or 4 of these for the price of a single pair of high quality tennis shoes and have tennis bags enough to last a lifetime. Non-racquet storage – On the exterior non-racquet storage is confined to a single large pocket. Use this for your mobile phone, power bars, sweat bands or other miscellaneous items. Inside, the amount of storage available for non-racquet items is entirely dependent on how many racquets you’re taking. If you’re like most club players you won’t be toting half a dozen racquets with so if you bring, say, 3 you can reserve the 2nd interior racquet storage space for items like towels, spare socks, water, spare t-shirts or anything else. 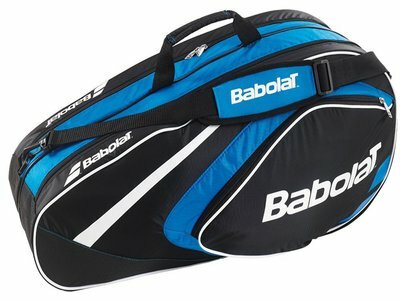 We can’t say enough about the Babolat Club X6 Racquet Holder bag. It may not have all the bells and whistles of some higher priced bags but it’s an extraordinary value no matter how you look at it. The Head Core 3R Pro Tennis Bag is a basic bag designed to hold up to 3 racquets along with the other essentials you’ll need to help you emerge victorious from your hard court pursuits. There are other, larger bags out there for the similar money but none that are built better than the 3R. Head has been doing this for a long time and has the science of toting tennis equipment down pat. Their bags are rarely flashy, rarely call attention to themselves yet will be there for you over the years keeping your valuable equipment safe and dry. If you’re heading to the club for a friendly match, the Core 3R Head tennis bag is the perfect bag for you. Bring along 2 or 3 rackets, some extra socks, a towel and a few power bars, and you’re ready to go. The Head Core 3R is a beautifully balanced bag. Whether you’re carrying it over your shoulder or via the convenient handle and whether you have it stuffed to the gills or simply have a racquet and a few sweatbands inside, the bag never loses its integrity and never feels clumsy. Because of this it truly is the only tennis racquet bag most players will ever need. Store 2 or 3 racquets easily: The Core 3R is more than a little deceptive in that it looks like a small tennis racquet bag when it’s anything but. You can easily hold 3 tennis racquets in this bag with no problem and even then you’ll be able to fit in some accessories as well. Attractive price: The Core 3R retails for about $40 which is the same as the Babolat Club X6 Racquet Holder bag. You won’t get as much storage space as you do with the X6 but the bag is built to stand the test of time and should never let you down no matter how many times you press it into service. Streamlined design: The 3R is a sleek and well-considered bag that never gets in the way on the court or in the locker room. If you’re cycling to the club to meet your friends, just sling it over your shoulder enjoy your ride. Durable and versatile: The 3R is built like a high quality piece of luggage, and you can treat it as such. If you’re taking it with you on your trip to Palm Springs or Miami, simply load it up and stow it above your seat in the overhead compartment. Something you can’t always do with bigger, bulkier tennis bags. 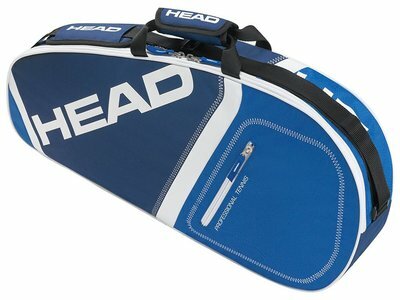 The Head Core 3R Tennis Bag is a “basic” bag but not in the pejorative sense of the word. It’s basic because it is designed to perform a basic function and it does that beautifully. Whether you’re a beginner looking for a great first bag or a seasoned pro looking for a bag that will suit your everyday needs, the Core 3R is all that and more. If you’re a fan of Babolat tennis racquets what could be more logical than transporting them to and fro in the Babolat tennis bags? After all, one being made for other means you’ll get a perfectly snug fit whether you’re toting 2 racquets with your Pure Drive bag or the full complement of 6. The Pure Drive 6 Pack bag is serious tennis kit. It’s designed for those who have their game down, know what they want, know what they need to bring with them on a given day and have a full arsenal of high quality racquets at their disposal. There are plenty of pockets, plenty of handles and plenty of style. It’s the kind of bag that says you have the game to back it up. The Babolat Pure Drive 6 Pack Tennis Bag is larger than some bags but it’s remarkably easy to control because of the well placed handles and dual padded shoulder straps for carrying backpack-style. The Pure Drive includes an end strap that allows you to hang the bag on a hook in the locker room or courtside or to use as an aid when mounting or dismounting the bag from your back. With so many ways to lift, move and transport this bag its size will never be an issue. 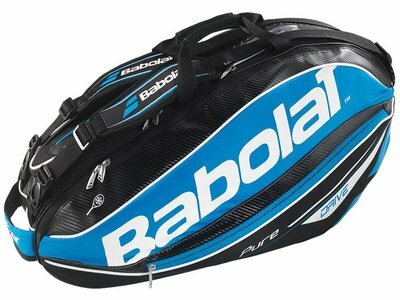 Full 6 racquet capability: The Babolat Pure Drive 6 Pack tennis racquet bag can easily accommodate half a dozen racquets. One of the many features that separate it from the competition is the Isotherm storage compartment that will accommodate 3 racquets and keep them safe from damage in extreme heat conditions. Affordability: In spite of the fact that the Pure Drive 6 Pack is a ‘bells and whistles’ bag, Babolat has managed to keep the price down. At around $75 this bag will provide everything even the most dedicated player could want from a tennis bag and do so for the price of dinner with a friend. State of the art design: The Babolat Pure Drive 6 Pack Tennis Bag is the product of serious designers dedicating serious time to make the bag both eminently functional but also stylish and sporty looking. Nothing about the Pure Drive looks or feels anything but top-of-the-line. Built to last: The Pure Drive 6 Pack Tennis Bag is engineered to withstand the rigors of tennis life: from being repeatedly packed and unpacked, carried around backpack style, dropped, picked up, carried in the rain and left in the baking sun at courtside for hours. It will never buckle under the stress you subject it to or fray and wear like lesser bags. Non-racquet storage – Another of the ‘bells and whistles’ we refer to above is the abundance of non-racquet storage included in the Pure Drive. Between the Isotherm storage compartment on one side and the standard racquet storage compartment on the other are 2 smaller compartments perfect for storing spare items of clothing and a discrete ventilated compartment perfect for storing your sweaty shoes after a long match. The Wilson Team 3-pack Racquet Bag should be standard issue for club players, spirited novices or anyone who enjoys tennis but is not fanatical about it. The Team 3-pack is well designed, well built, convenient, compact and affordable. The Team 3, like many other Wilson tennis bags, is extremely lightweight and portable without a lot of bells and whistles but with plenty of moxie and trim. The appealing gun-metal red design sets it apart from most other bags that embrace bold primary colors. In our humble opinion, it might be the best looking tennis racquet bag Wilson makes. The Wilson Team 3-pack Racquet Bag sports the kind of thoughtful design usually reserved for high-end bags intended for club or tour pros. It says to the novice or part-time enthusiast that you don’t need to be out there every day at the break of dawn practicing your cross court backhand returns to have a bag that’s effective and looks great. The main handle is sturdy and well-placed, the shoulder strap comfortable and firmly attached to the bag’s body and the end loop allows you to hang the bag at court side if you wish or simply toss it over your shoulder as you make your way from court side to the showers. No-nonsense 3 racquet capability: Unless you spend your life on and around the court, chances are you’ll never be toting more than 3 racquets with you at any one time which makes the Wilson Team 3-Pack Racquet Bag more than enough by way of storage space. Even when carrying 3 racquets, however, there’s still plenty of other space for accessories. 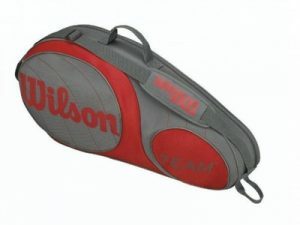 Price: At around $60 the Wilson is a bit more than other 3-pack tennis racquet bags. We suspect that has as much to do with the time and effort that went into making the bag look and feel so great as anything else, and in that regard we’d say it’s definitely worth the extra stretch if you really care about appearances (and who doesn’t?). Looks: We’ve said it already, but we’ll say it again: the Wilson Team 3-Pack tennis bag looks like a million bucks. It’s simple; clean design will grab hold of you the minute you see it and won’t let go. Its compact design belies the fact that there’s plenty of space inside for just about anything the average tennis enthusiast would want to be carrying. Build quality: The Wilson 3-Pack Tennis Bag is put together like few other sports bags at its price point. We suspect you’ll still be using this as your everyday bag even if your game matures after you purchase it and you graduate to more feature-rich bags for tournaments and the like. Non-racquet storage – The Team 3-Pack from Wilson has 2 generous pockets on the exterior that will easily accommodate your personal belongings while you’re bouncing between the net and baseline. If you decide to bring 1 or 2 racquets with you, you’ll also free up lots of room inside for a towel, change of socks, water and more. Overall just a beautiful, practical tennis bag. Finally, pulling up the rear of our best tennis bag reviews we have something a little different: the Cinda B Tennis Tote II Bag. The Cinda B Tote II is built for fun, and everything from the design to the colors to the emphasis on storage capacity for non-racquet items reinforces that notion. Empty, the bag is quite light and easy to carry around either using the strap handles up top or the shoulder strap (although we’re going to admonish Cinda B a bit here for not making the shoulder strap just a bit more comfy). For a lot of casual tennis players the Sturm und Drang, the “this is serious business” attitude of tennis fanatics can be a bit much. After all, this is supposed to be fun, right? 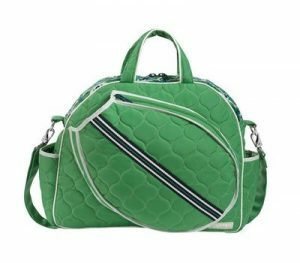 So lighten up and have some fun with Cinda B tennis bags for women. This bag is machine washable, plenty durable and available in a variety of fun colors including powder blue, pink and leaf green. Next time you’re heading out to play a set with your BFF make sure you arrive sporting the Cinda B Tote II. External racquet pocket: Because we’re talking fun here and not the safeguarding of your professionally strung, graphite and boron racquets, the Cinda B sports an exterior pocket into which you slide the head of the racquet while the grips remain free. Because you’ll likely be carrying the Tote II at your side, this arrangement shouldn’t be a problem. Price: Perhaps the thing that will surprise most about the Cinda B Tote II is the price. At nearly $150 it’s several times as much as bags that will do a much better job of protecting your racquets. Again though the Cinda B is all about fun and a major component of fun is style, something the Cinda B has in spades. Appearance: With its quilted surface and fun-loving color scheme you’re not going to see the Cinda B on center court at the US open any time soon. And that’s just fine with most of the ladies who would arrive for their friendly match with the Cinda B draped over their shoulder. The bag looks more like a standard tote bag than tennis bag (the name ought to give that away), and in that sense, it looks like a well-made tote. Overall quality: There is no doubt that the Cinda B tote is a well-designed and well-constructed girls tennis bag. Although it’s extremely light, it nonetheless feels incredibly solid with the center storage area filled with spare shoes, socks, and shirts. Slip full water bottles into the side pockets without fear and don’t ever worry that having your racquet handles hanging out into the fresh air is going to cause stitching to give way. The right tennis bag is as important as the right racquet or the right grip, with “right” in this case having as much to do with your level of involvement in the sport as it does with your personal preferences regarding styles and colors. The right bag for someone that plays daily and perhaps even qualifies for the occasional tournament will be fundamentally different than the right bag for a novice or weekend warrior. Certainly, if you’re hitting the court once a month with your neighbor you’re not going to need to bring a dozen racquets to the court with you. A standard 3-pack bag should do you just fine. Conversely, if you’re attempting to qualify for the US Open you’ll be bringing a full nylon jacket of racquets along to be prepared for all contingencies. The avid player may want to go with a 6-pack bag simply because, even on those occasions when perhaps they only need 2 or 3 racquets, they’ll still be able to use the extra storage space for towels, water, spare socks and the like. If you’re the type of player who takes large bags of tennis equipment with them when they travel, you’ll want to consider a bag with wheels. Likewise, if you’re toting 12 racquets around on a regular basis it can all become a bit much for the shoulders and, without a bag with wheels, you could wear yourself out before the first serve is hit. If on the other hand, you don’t typically bring more than 1 or 2 racquets with you there’s no need for wheels. Carrying your bag backpack-style can be a great way to take strain off your arms and shoulders especially if you are the type who regularly carries a half dozen or so racquets with you. Not all bags will offer the dual padded straps necessary to make an effective backpack, so if you’re interested in this option to make sure the bag you choose has 2 straps and not just one. And don’t confuse tennis backpacks for a tennis bag with dual straps that you can carry like a backpack. The tennis backpack is typically much smaller, will hold only 1 or 2 racquets and is intended for casual players. In this review of the 5 best tennis bags we’ve only featured 1 of the many tennis tote bags on the market. Whether or not a tote bag will be right for you depends almost entirely on your attitude about tennis. Is it a fun past time you engage in occasionally in order to get some exercise and catch up with friends? Or is it the red in your blood and that which you eat, sleep and breathe. If it’s former, a tote-style bag may be just right for you. If it’s the latter, you’ll want something more substantial. A great tennis bag can ramp up your enjoyment and make getting the necessary gear to and from the court significantly easier and safer. Great tennis bags also help protect your investment (good tennis racquets aren’t cheap) and keep your spare clothes and towels nice and dry, so they’re there when you need them at the end of the match. We hope you found this review of the best tennis racquet bags helpful.